September is here, but fear not, dear readers: autumn is also synonymous with the grape harvest! Since Roman antiquity, wine has been worshiped as one of the most marvelous gifts of nature and culture; the Roman poet, Horace, celebrated wine which “gives courage, produces frankness and friendship, beautifies hope, drives away worry, brings out the fine arts, inspires eloquence and gives birth to freedom”. No less! And so, it is in this spirit that we visited Antinori nel Chianti Classico, a winery located a few hundred meters from Castello Lorenzo, our magnificent Tuscan castle between Florence and Siena. Castello Lorenzo is beautiful most of the year and especially in Autumn, when we were lucky enough to visit last year. 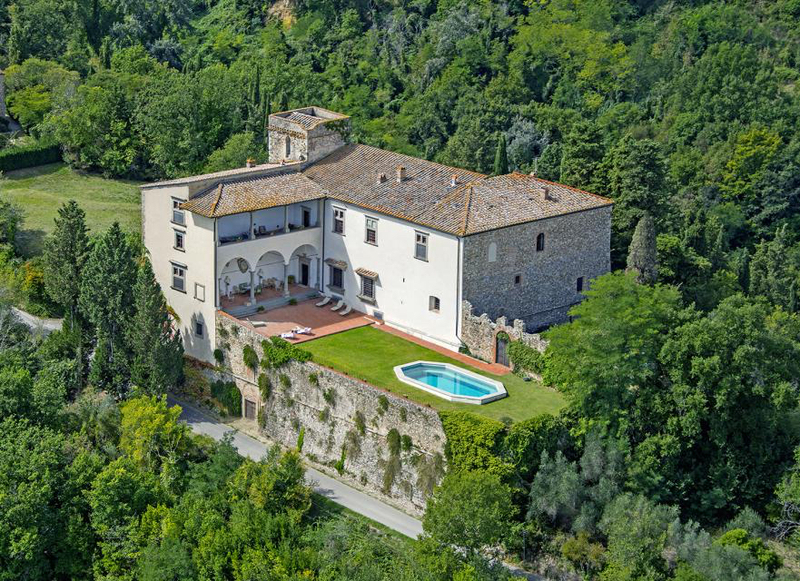 Originally a medieval fortress built in the eleventh century, it was converted in the fifteenth century into a magnificent villa of the Tuscan aristocracy with a unique charm and impeccable taste. 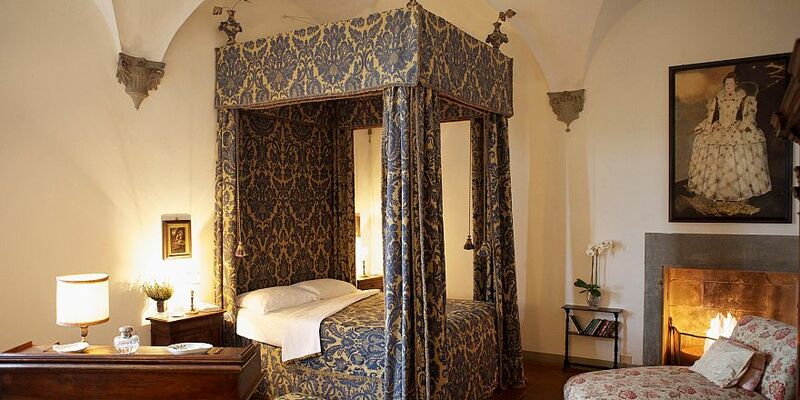 All its spaces and rooms are elegant and refined, with a particularly beautiful loggia which opens onto the Tuscan countryside, offering a show of nature’s splendid Fall color, inspiration to more than one Renaissance painter. Cherry on the cake: the swimming-pool has direct sunlight throughout the day! Secret tip! If you book directly through Commendable Rentals, you’ll enjoy our Fall Special: 10% off! Walking down the hill of Castello Lorenzo, you’ll find yourself on the Antinori Wine Estate. The Antinori family has been committed to the art of wine-making for over six centuries. 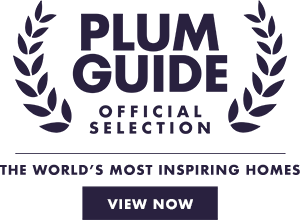 The family’s historical heritage lies in their estates in Tuscany and Umbria, however over the years they have invested in many other areas, well known for producing high quality wine. The estate is simply breath-taking: the winery overlooks the countryside from a terrace surrounded by vineyards. Designed to have a low environmental impact and maximum energy savings, the winery is an unusual and fascinating structure: almost invisible to the eye from the distance, the winery’s façade appears as two elegant horizontal cuts in the Tuscan landscape and its most spectacular feature is undoubtedly the impressive spiral staircase that connects the building’s three levels. 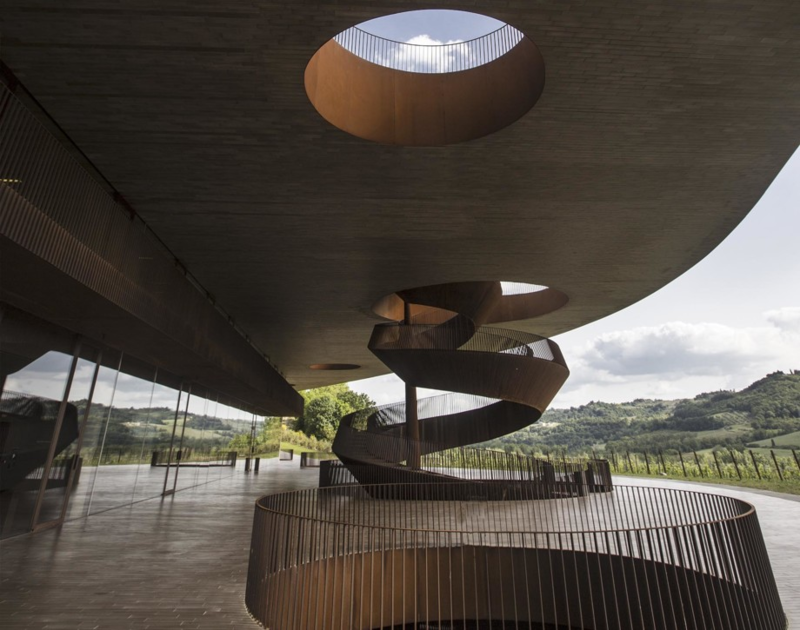 Indeed, The Antinori nel Chianti Classico winery is part of Toscana Wine Architecture, an association that unites unique and original wineries designed by famous contemporary architects. While staying at Castello Lorenzo, you can visit the cellars and of course participate in tastings, but also have lunch in their restaurant Rinuccio 1180 located on the roof of the building. We will take care of your reservations, tastings and excursions! Celebrating the start of the cold season in style!